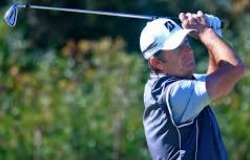 Australian Professional Tim Elliott is the leader after two rounds of the NZPGA Senior Championship. Elliott was the best player today with an even par round of 71 on the Waitikiri golf courseto go with his 73 at Bottle Lake yesterday. The third and final round will be played at Waitikiri tomorrow and Elliott has a one stroke lead over Auckland professional James Kupa and Australians Darren Rix, David Good and Brad Burns.